It's hard to believe, but fall is on its way. 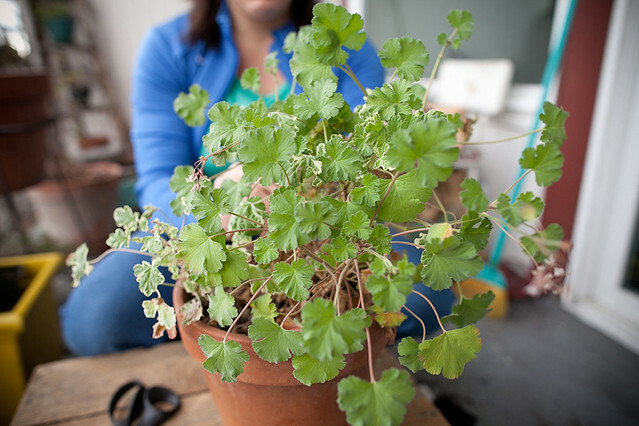 Here, a quick guide on what to plant now for the perfect patio harvest come cold weather. It doesn’t necessarily feel like it, but sadly summer is waning. Our days are shorter and while temperatures may remain hot (you lucky ducks! ), shorter days means less light for growing plants. In many states across the country this means it’s time to get the winter garden going, if you haven’t already. Late summer begs for cool loving crops that are quick to grow. For anyone starting now, smaller leafy greens are your friend. By nature, leafy greens require less direct sunlight, prefer it when it’s a bit cooler, and can be grown in both a proper garden bed and a smaller container. Most greens germinate quickly and many can be found as starts. Following is a list of five plants to grow right now – some can be harvested before winter sets in, and others can be left to overwinter in regions with mild temperatures. Be sure to get planting straight away though. Mother Nature is moving fast and I can tell you from experience...she usually wins the race. Getting Started You’ll need a pot filled to the brim with potting soil. 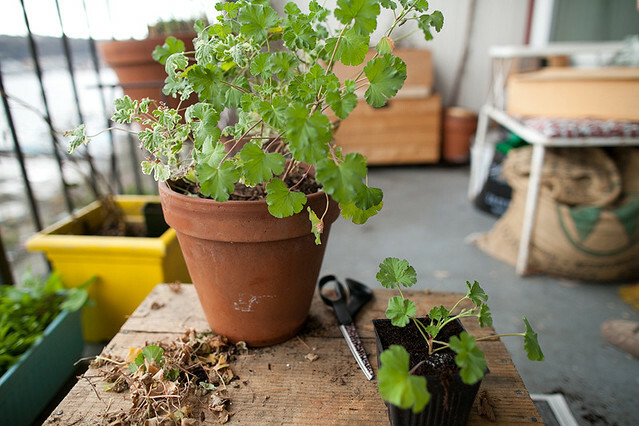 Feel free to use an old pot; just refresh the soil and make sure you remove all old root hairs. If you’re using seed, you can direct sow, which is a method in which you sow a seed directly into the soil. Of course, you can also use a start when planting this fall. Plant starts are a bit easier as they give you a jump on the season and don’t require you to nurture seeds through germination. When transplanting a plant start into a pot, you need only provide enough space for the plant to grow. 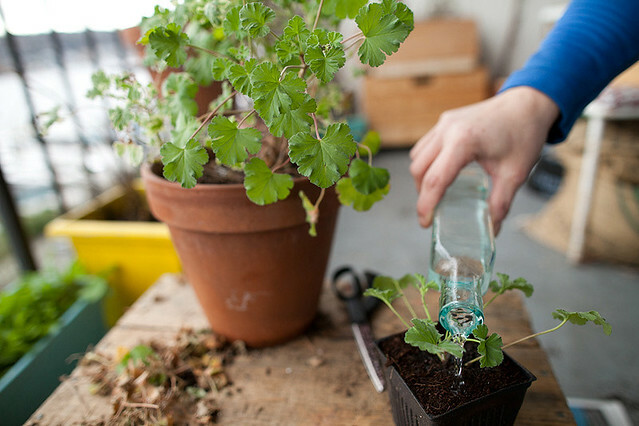 Loosen up the transplants root system and be sure to separate out individual plants so you allow them room to come to full maturity. 1. Lettuce Many lettuces will grow and mature in less than two months. These are wonderful immediate gratification kind of plants, as they germinate and grow quickly and are easily harvested. Lettuces come in assorted sizes and colors, allowing for a nice salad bowl mix, but be sure to choose varieties that will do well late in the season – I really love Green Deer Tongue lettuce for winter and have heard great things about Arctic King, a butterhead for anyone wanting a traditional green lettuce leaf. Where and When to Plant • Sow lettuce seed or plant starts through the month of September. Pot Size • Sow seeds in a long, shallow, pale-colored plastic container -- lettuces are shallow-rooted, and plastic containers hold water a bit longer than clay ones. • If using seeds, be sure to keep the seedbed moist until seeds germinate, which typically happens in five to seven days. How to Harvest • To harvest lettuce, try to remove the larger outer leaves first. Using a small pair of scissors, cut the individual leaf stems as close to the base of the main stem as possible, leaving some interior leaves behind. Where and When to Plant • Sow in late summer. Pot Size • Chervil can be grown in a medium-depth pot, about eight to twelve inches deep. The wider the pot, the more thickly the plant will fill in, so keep that in mind when choosing. How to Harvest • Cut the entire stem of chervil and use both leaves and stem. • The plant will quickly fill back in, so harvest often! 3. Green Onions Scallions, chives, green onions – they are all in the same family of allium and are quick producing. You can grow for greens or the whole plant. Where and When to Plant • Green onions can be sown in late summer for a fall harvest. Pot Size • A shallow container works well. Try these in a gutter garden! How to Harvest • Pull the entire scallion from the soil, if you’d like to use the white. • For greens only, trim the stems leaving a few inches of the green onion behind so it can re-grow. 4. Arugula Arugula is a leafy green that produces long flat leaves with a distinct peppery flavor. Each seed produces one thin stem, which leaves grow out from. You can further your harvest by cutting them back often. Where and When to Plant • Sow arugula seeds in the top layer of potting soil from late August through October. 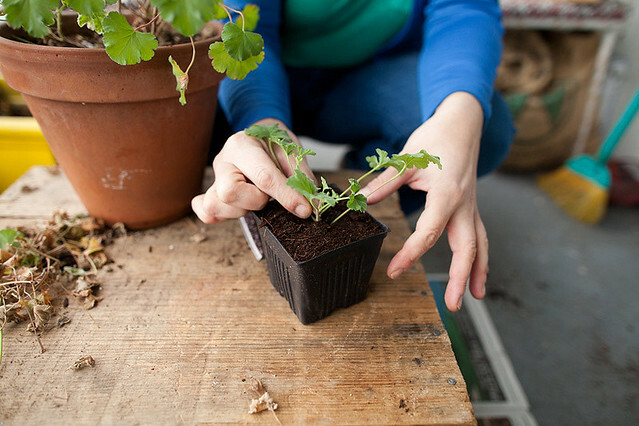 Pot Size • If given the room, arugula plants may grow to well over two feet! In a small to medium container, however, leaves grow the perfect size for salad. How to Harvest • Cut arugula at the base of each leaf off the main stem. • You can decide for yourself when the leaf is big enough, but larger leaves are much more peppery. 5. Chicories Chicories are essentially bitter salad greens that can be eaten raw or take well to grilling. Chicories such as escaroles and endives are good choices for fall. Where and When to Plant • Sow seed or plant starts now through the first week of September. 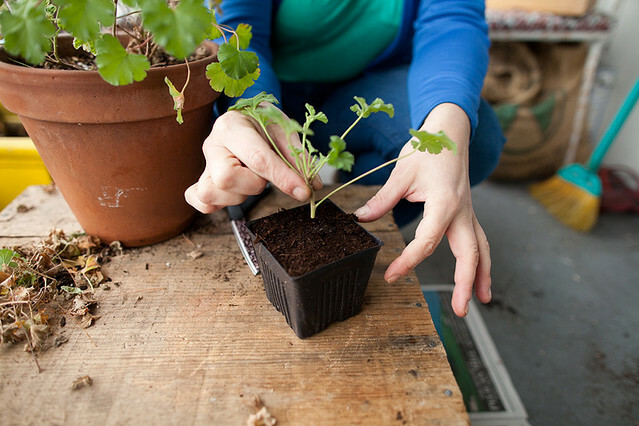 Pot Size • Sow seeds in a long, shallow, pale-colored plastic container, as chicories are also shallow rooted plants. How to Harvest • To harvest, remove the larger outer leaves first. Like for lettuce, using a small pair of scissors, cut the individual leaf stems as close to the base of the main stem as possible, leaving some interior leaves behind. I've been growing food for people in their backyards since 2004 and while my breadth of knowledge for edibles is deep, I've only just scratched the surface of all other plants. Landscape plants, bushes, annual flowers and trees remain a mystery to me. Solution? Write a column! Introducing PLANT SPOTLIGHT. I've grown Tangerine Sage in my gardens for years and love it. It does well in a large pot on my patio and absolutely explodes if given the space in a garden bed. I use the leaves in sun tea infusions or add them to tomato salads. Plus, the blooms can't be beat for attracting hummingbirds to a space. All plants have different growing needs, but salvias do well in full sun or partly shaded areas of the garden. They are off-putting to most pests, so you shouldn't have to worry about deer or bunnies. And they are drought tolerant, so a great choice for any apartment dwellers that are adding containers (which tend to dry out quickly) or a garden bed that does not have regular irrigation. Swanson's Nursery put together this amazing collection of salvia plants - a great resource for anyone wanting to add herbs, color and attract pollinators to the garden. In honor of National Pollinator Week, let me also add that an edible garden is only prolific when insects, bugs and birds spend time there. These pollinators play crucial roles in our ecosystem and help to disperse pollen and seed. While bees are most easily thought of as pollinators, flies, butterflies, beetles, moths and even bats are help this natural lifecycle. With a foundational role in our ecosystem, it is thought that pollinators contribute to 80% of the planet's plant life. So, it is VERY IMPORTANT that we all do our part and support this process. Swanson's also put together a great pollinator resource, for a quick reference tool. If you live in the city, go nab yourself a plant today! And if you need MORE help, don't forget to check out Swanson's Grow With Us Project - they offer advice and give you a discount on plants. Total win. AND, and, and……stay tuned for details on a great promotional give away they are hosting next week! We are collecting awesome garden ideas on Pinterest and would love to hear from YOU. I'll have details here - stay tuned. Rosehips are easily foraged in fall and make awesome jams, purees and tinctures. I was recently reminded rosehip season is upon us, when I read Johanna Kindvall's blog, kokblog, which I've been reading for yeeeeeears. She is a one-woman illustrative dynamo (check out my homepage illo) and I love her recipes and ideas. Her sister, Anna Kindvall (who curates electronic art), makes this amazing-sounding sherry that I think we should all attempt this year. Anna likes to use rosehips before the frost (more acidic), but I've always picked them after Seattle's first frost - in early November. Check out kokblog for the recipe and notes on making and storing your foraged sherry. And for more rosehip info, here is an earlier piece of writing on rosehips from my second book, Apartment Gardening. "Rosehips are the seed buds that follow the rose bloom in July. Rosa Rugosa plants make hips somewhere between late July and September. They tend to grow along coast lines and water which is likely why some people call them rock roses. You can identify these bushes when in bloom by their strong rose-scented flowers which bloom in white and pinks all the way through bright fuchsia. Make note of their location and head back in four weeks to collect the rosehips. The rosehips themselves look like little tomatoes hanging off the plant. They are often orange-red and have shiny skins. They are more round than long, and are about the size of a red globe grape. Harvest rosehips by snapping the stem from the plant. They are strong enough that you can toss them in a plastic bag and then a backpack without doing too much damage. Use them within a day of bringing them home. Rosehip puree can be made and frozen and used at a later time in recipes." That's about 4 inches of root depth and just a few root hairs for a BIG head of lettuce! Another great example of why lettuce in pots works - just make sure to use a medium sized pot so you give it room to grow. I was featured in Garden Design Magazine's website this week. Following is a photo tour of my apartment and garden, along with some thoughts about what makes a house a "home". Sort of a funny way to think about your house! I'd love you hear what makes YOUR house a home. Announcing the arrival of my new book! Buy on Amazon now, or in the local bookstore starting April 11th. I will be the first to admit I'm actually not thrilled about growing edibles in containers. Or really anything in containers! I much prefer to till fields (no matter how small and unfield-sy they can be) and work to create healthy soil over the long term. But I live in a small apartment and I have only my deck. My east-facing deck, I might add, where sun ducks behind the building by noon at the latest. That said, I can't not try (I mean, it's my job to grow food) and over the years, I have learned to adapt. Now, my deck is cluttered with pots and containers full of great-to-grow edibles that supply my kitchen and my pantry with produce for my meals. Lettuces, are one of the easiest most rewarding of plants to grow and I grow as many as I can in abundance. Here are some pics from a spring sowing that I am now offiicially harvesting the last of - sow'd from seed in early April and it's now end of June. From seed to harvest was just about six weeks. From there, I cut from each plant for the better part of a month. They are only now just beginning to falter and turn bitter in the heat. If you sow lettuces this month, be sure to choose varieities that won't bolt in the summer heat. I like the heirloom Deer Tongue, Little Gem (a small-headed romaine) and Rogue d'Hiver - a red-tipped leaf that has a nice crisp leaf and rib, but also has tender leaves. Perfect.